With advanced modeling capabilities, low cost and a wealth of innovative features, Enterprise Architect combined with MDG Technology for SysML is the premier team-based modeling environment for the systems engineer. 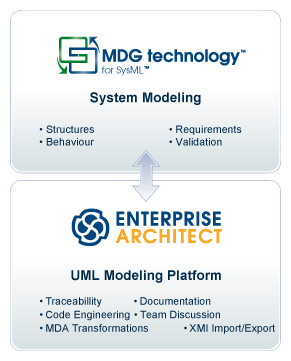 Enterprise Architect, together with MDG for SysML, delivers a powerful, low-cost modeling solution for Systems Engineering. Specify system requirements with powerful requirements modeling support. Analyse system-to-system behavior using Interaction Diagrams, Activity Diagrams and Statecharts. SysML 1.1, SysML 1.2, SysML 1.3 and SysML 1.4 supported. Conduct MDA (Model Driven Architecture) Style Transformations. Visualise and trace requirements to model elements throughout the entire development lifecycle. Built-in Discussion Forum: Create posts, access discussions and manage threads for team communication. Custom Search Facility: Perform complex searches, view SysML Allocations and generate reports from the results. * Enterprise Architect 12.1 and above requires purchase of the licence only to activate the preinstalled SysML 1.4 functionality. *SysML 1.3 support requires Enterprise Architect 10, or later. *SysML 1.2 support requires Enterprise Architect 9.0, or later. *SysML 1.1 support requires Enterprise Architect 7.5, or later. Professional and higher Editions only. Ultimate & Business & Software Engineering Edition. Download the Trial Edition to experience the fully functional 30-day trial version of MDG Technology, or purchase the full version of MDG Technology for SysML. More and more system engineers use UML (Unified Modeling Language) or SysML (Systems Modeling Language) for the specification and structuring of their systems. SysML (Systems Modeling Language) is a general-purpose modeling language for systems engineering applications that is defined as a dialect (Profile) of UML 2. It supports the specification, analysis, design, verification and validation of a broad range of systems and systems-of-systems. These systems may include hardware, software, information, processes, personnel, and facilities. UML / SysML is ideal for capturing the requirements, the description and specification of system characteristics and system architecture. The main tools include use case diagrams, Sequence diagrams, Activity Diagrams, State Structure charts and diagrams.